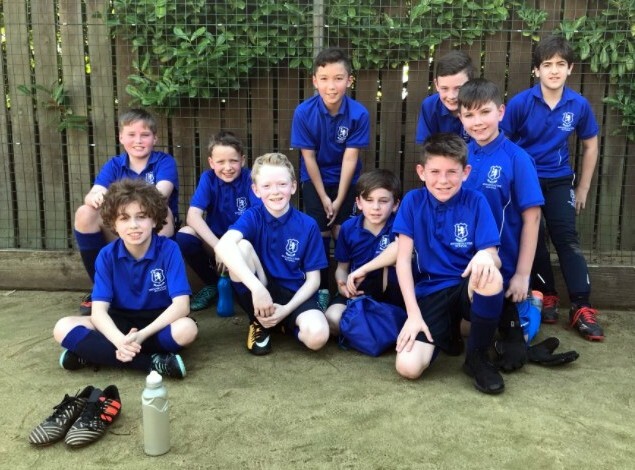 On Friday Bridgewater travelled to local rivals Branwood Prep to take up the challenge of an u11s football match. It has been a long season for the team who have made great strides individually and collectively in how they play the game and with a bit more luck in the cup competition who knows what they may have achieved? If this was to be the final game for the Prep IV members of the squad, then they were determined not to lose. With a couple of new members of the team drafted in for their debuts and a new goalkeeper to bed in, then this was always going to be a potentially tough game for the team. However, when you have a striker like Daniel up front and the strength of Ethan in midfield, added to the guile and quality of Archie captaining the team, then there was not much need to worry about the result in the end. Debutants Dante and Xander both fitted into the side when called upon with comfort and made important contributions at key moments in the game. Owen looked solid at the back and won his fair share of tackles and held his position very well. Alfie was busy and energetic up front, whilst Oliver A looked assured in goal, especially with the ball at his feet. Harvey and Matthew C both provided energy in chasing the opposition down and both went close to getting on the score sheet too. prevent a thunderous drive from Ethan and a quick fire hat trick from Daniel. The match continued in the same way in the second half, with Archie dominating in midfield and Bridgewater creating chance after chance. Daniel completed a double hat trick (6 goals!) and looked a threat every time he got near the Branwood goal. A late couple of goals gave the scoreline a little more competitive to look at, but 7-3 was a fair reflection of the dominance Bridgewater showed from start to finish. A well deserved win for the team and they certainly finished the season in style. Prep V will pick up the mantle in September but many of the boys will have a great opportunity to play together in September when Bridgewater head off to Valencia for an exciting and unique tour!